Ok, last post to do with the book, I promise, for real this time, honest it’ll be at least two whole posts until I mention it again. 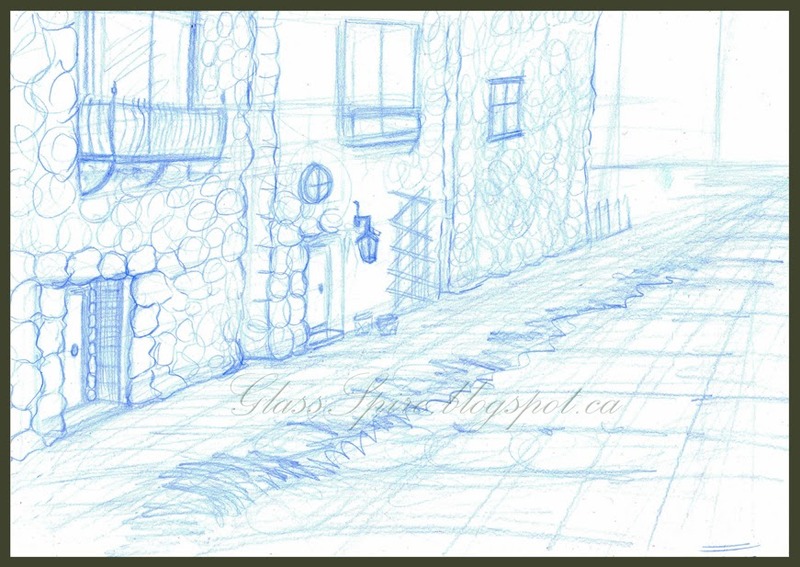 This one is all about the layouts I created way back when, so it will be art heavy, dealing with my initial concepts of what the places in this tale might look like. Many of these are largely unfinished, they vary in quality and handling, some have suffered bleed through or dreaded tea spillages over the years. The ideas are still sound even if tea drenched intentionally or otherwise so let’s take a walk around. 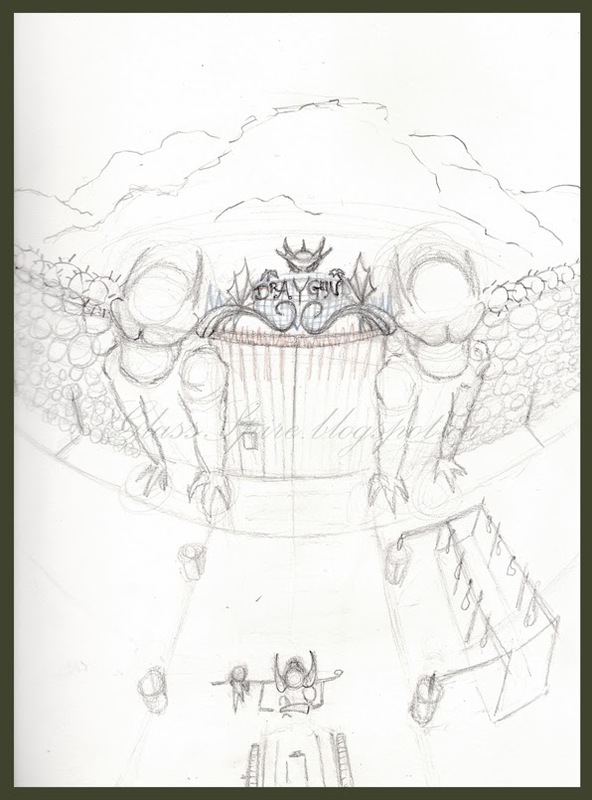 First up, gates to Draygun city: those are meant to be huge stone dragons. I imagine these gates to be colossal but like most things on the isle of Niam rather broken and rundown. 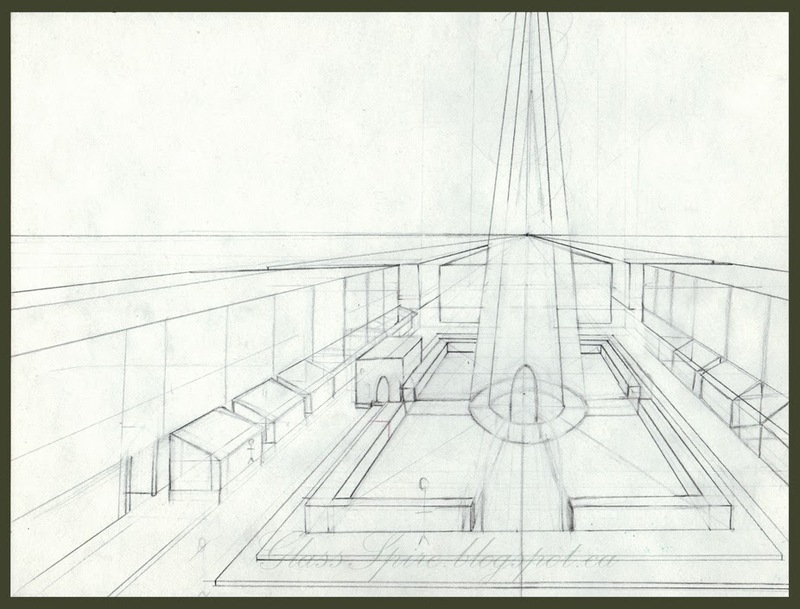 A rough layout of the city centre within Draygun, showing the glass spire that gives this blog its name. So this one is a little confusing due to my choice of warped perspective; to explain, there are tunnels running beneath the houses of Draygun city, these are primarily lit by glowing moss (the blue bits here) and this is a semi down shot of a tight bend in one of those tunnels. 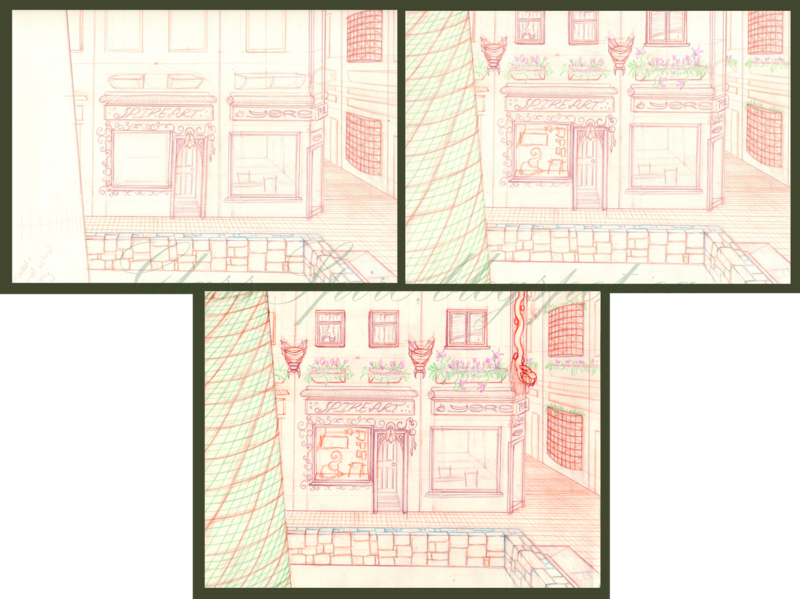 Above are the first three renditions and below is the final. I might have a go at colouring this at some point, at present the different coloured pencils merely served to help me get less confused in the myriad of lines. 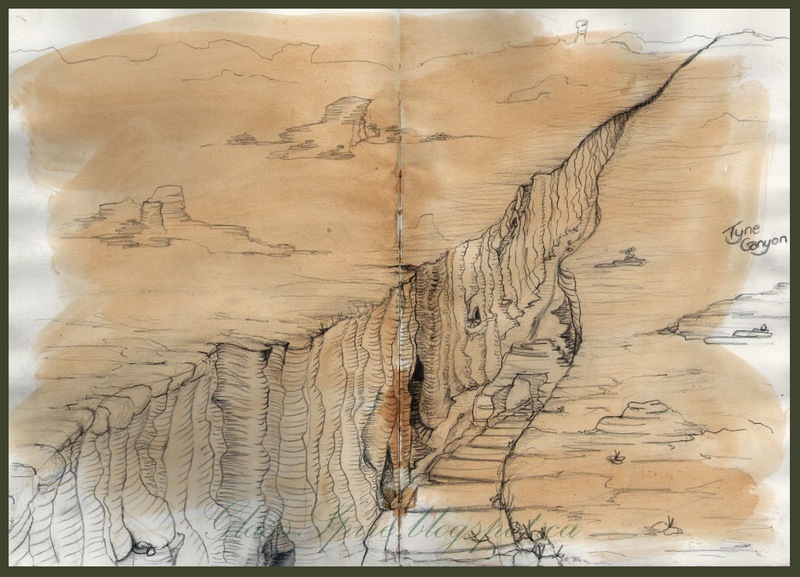 Niam’s wastelands and Tine canyon; Fao and Amber live here and yes this was intentional usage of aforementioned tea staining. 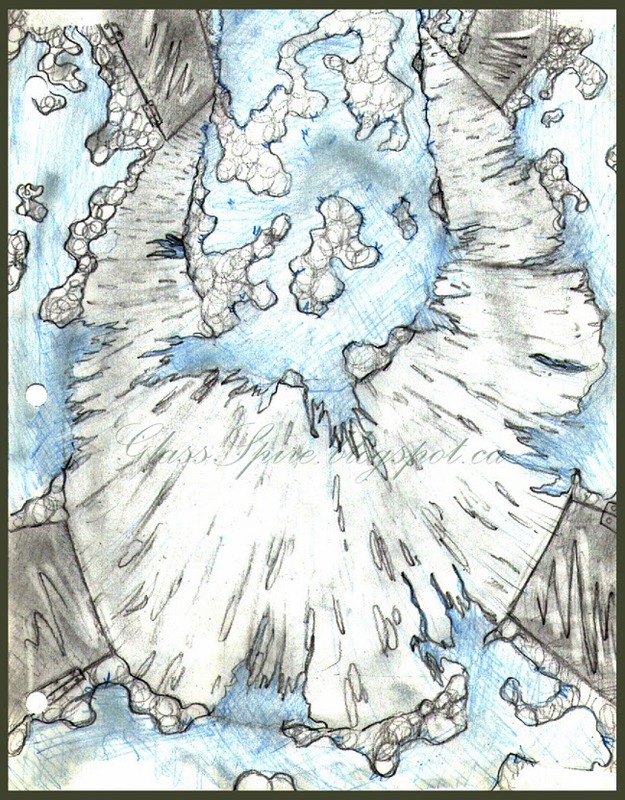 Below is an idea for the entrance to Amber’s cave within the Tine. Knuks is a small town outside not far from the major city of Draygun. 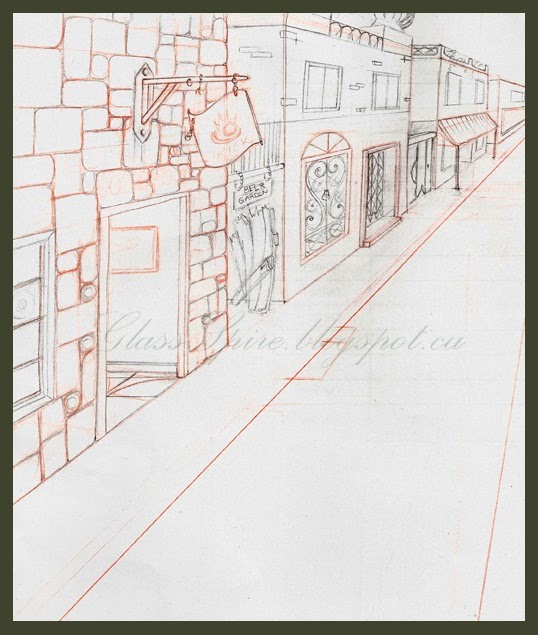 Below is a very very clean (by Knuks standard) example of a street. 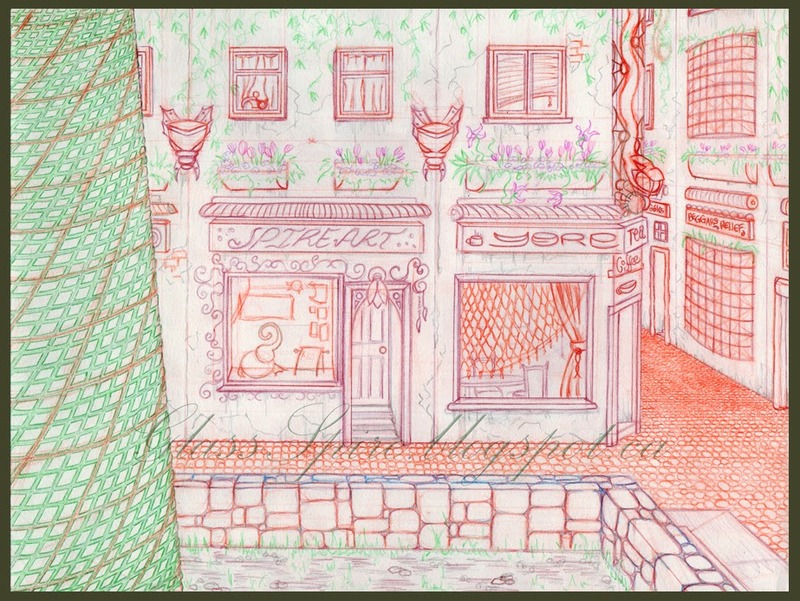 Another example of a street this time in a town called Odel which is not on the island of Niam. A very basic room; I imagine this room to be in the very seedy ‘hotel’ in Odel. Yet another confusing down-shot, guess I must be a fan of those. 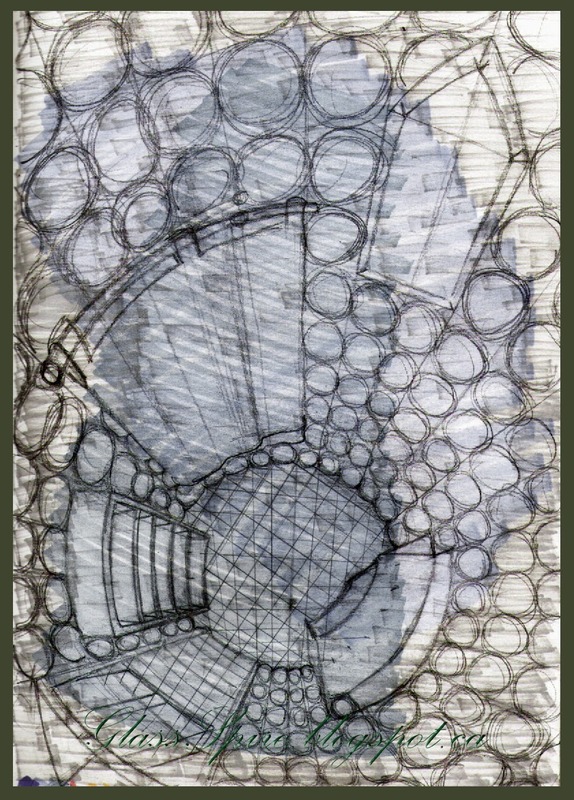 This is a small cylindrical tower in one of Dirzryn’s hideouts, a place I imagine he goes to sit and drink tea and brood. 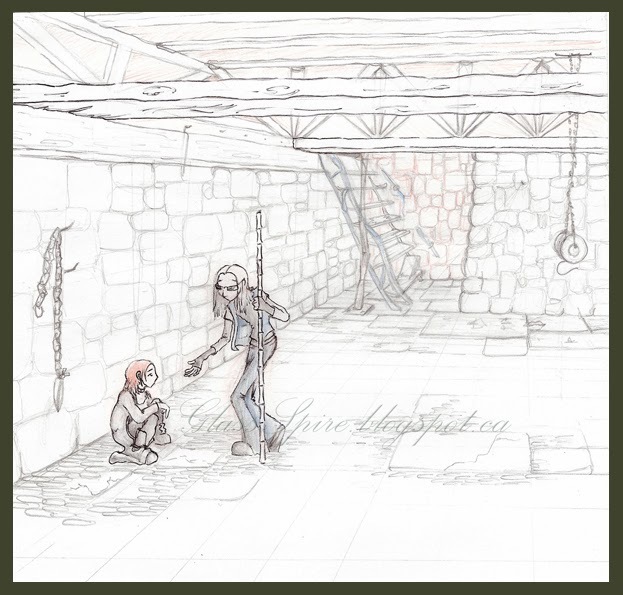 The location of this dungeon is not known, however I imagine it to be a place where vampires keep their thralls and just you know generally torture people. 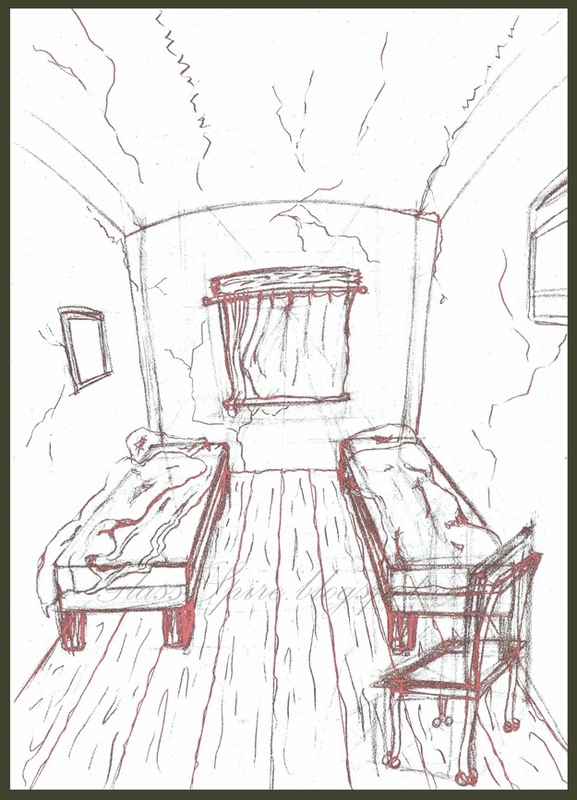 Speaking of torture, below is an early concept for a place affectionately called ‘the room of the dead,’ I’ll let your imagination run with the reasons why it’s called that. 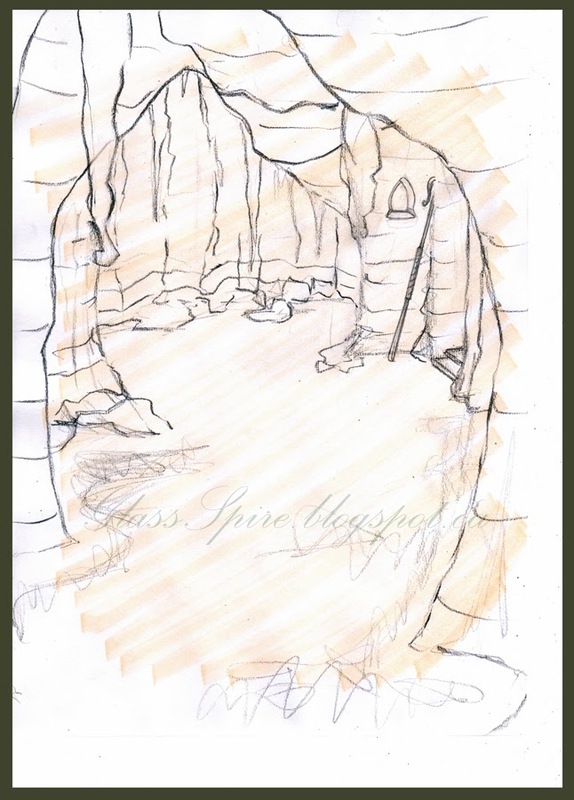 This had both bleed through and tea-spills – oh joy, oddly the bleed through on it is actually from the first portrait sketch of Dirzryn. Last but not least, well I couldn’t leave without posting up our lovely Cold harbour dungeon. 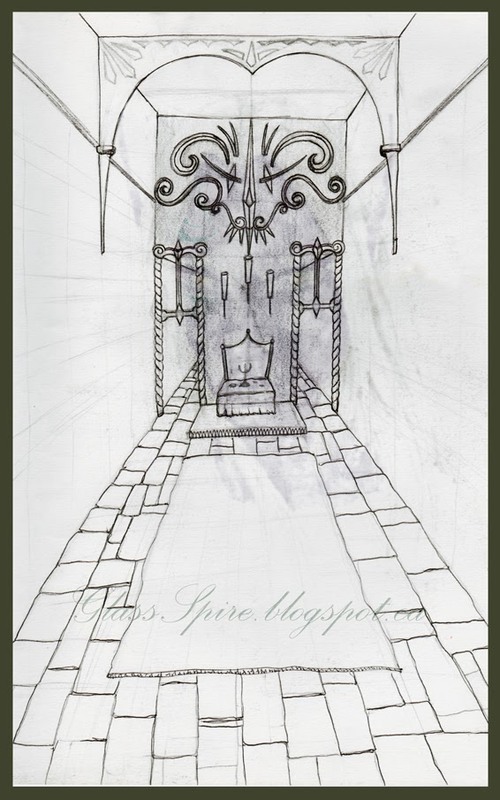 This sketch was created for a written role-play we set in The Elder Scrolls universe, specifically the daedric realm of Cold harbour because none of the games at that point had any playable content in that realm. 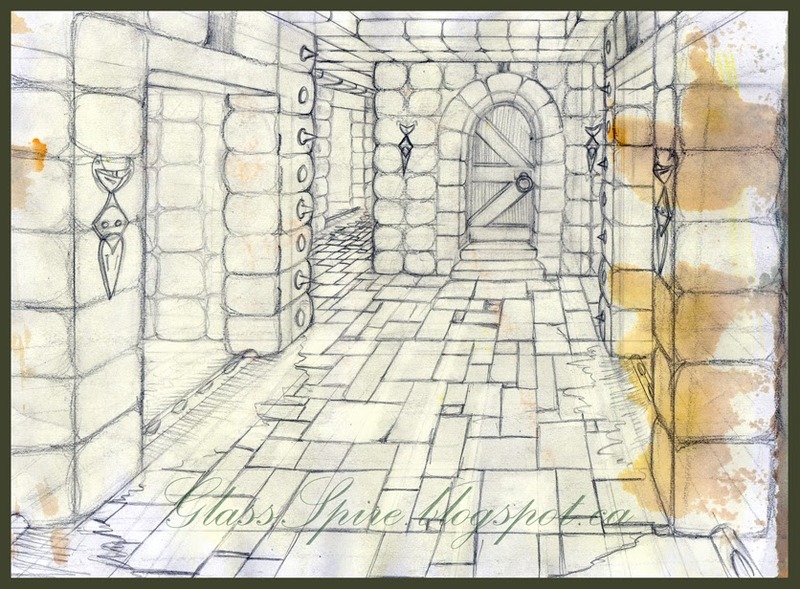 The role-play began in an empty cellar, hence this sketch. Also it seems even more appropriate to mention it again now since the makers of the Elder Scrolls games are soon to release their new MMO which is set in …yep, Cold harbour!